A microwave oven is a fast and convenient way to cook food or to heat up food that has been previously cooled. The vast majority of homes in the United States have a microwave oven. This also extends to the workplace. Nearly every day, you probably have something that is microwaved or walks past a microwave in use. Microwaves work by using electromagnetic radiation to raise the temperature of a cell. The electromagnetic radiation causes electromagnetic fields (EMF). Microwaves and pregnancy. Is there a problem? There has been concern over EMF and pregnancy, that EMFs might cause low birth weight or birth defects. There have been no studies showing clear connections between the two. To ensure your safety when using a microwave when pregnant or not, be sure that your microwave does not leak. Most recently made microwaves will not work if the seal on the door is broken, so newer microwaves tend to be safer. 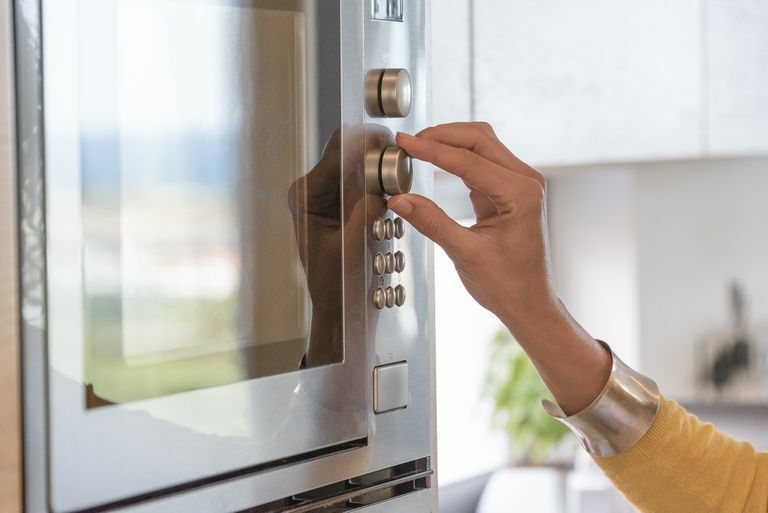 Some practitioners suggest that if you are concerned, simply put your food in the microwave and walk away while it's cooking to avoid the potential exposure to EMF. However, most practitioners will tell you that it is safe to use the microwave during all three trimesters of pregnancy. If you are concerned about your microwave or if your microwave is older, consider replacing it with a newer model. This can help alleviate some of your safety concerns. What else you can do is to use proper food rules when it comes to what you heat up in the microwave. For example, some plastics can melt or warp in the microwave, this can cause chemicals to leach into your food. You should always use the microwave with approved food containers, like glass and specific plastics to avoid this risk. What you are really the most at risk for is burning yourself from food or water heated in the microwave. Microwaves can make food temperatures really hot and they are known for uneven heating. So be sure that whatever you are making in the microwave is cooked long enough to be warmed appropriately, but not overdone. Once cooked, be sure to allow it to cool sufficiently, and when appropriate, be sure to stir the food to make sure the temperature is even. Consider using oven mitts to remove bowls and dishes from the microwave to avoid burns. When lifting lids, do so away from your body to prevent steam burns from the released steam. These may all sound like common sense, but we often take microwave food safety for granted. That said, not finding something connecting the two may be from a lack of well-done studies. All of the studies usually recommend that more studies be done or that they look at things from a different perspective. Although it is important to remember that these days, EMF come from many different places. When in doubt, remember that you can also go the slightly slower and more traditional route of using the oven or stovetop to cook your food. Microwave Oven Radiation. Food and Drug Administration (FDA). October 8, 2014. Robert E. Teratology. 1999 Apr;59(4):292-8. Intrauterine Effects of Electromagnetic Fields--(Low Frequency, Mid-Frequency RF, and Microwave): Review of Epidemiologic Studies.